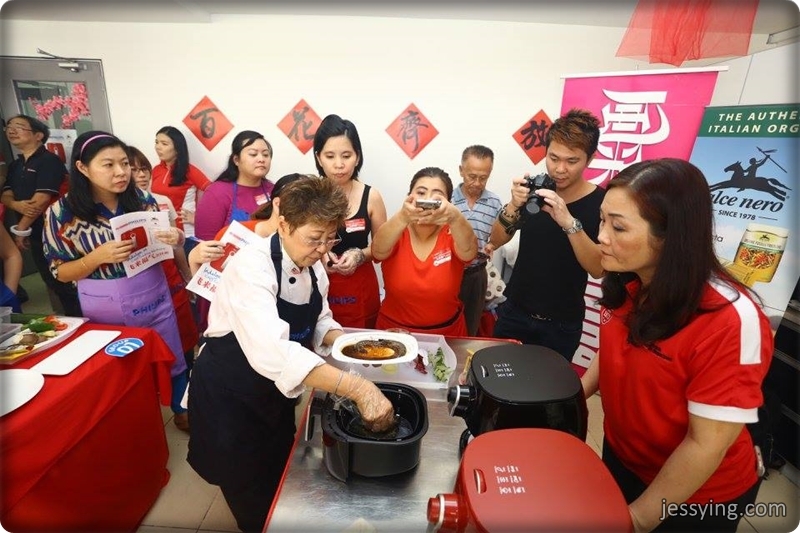 I always wanted to own a AirFryer and was glad to attend Chef Amy Beh cooking class where she whip Up Some Chinese New Year Delights with the latest Philips Airfryer TurboStar which is the latest in the Philips range of airfryers. Philips Airfryer TurboStar features a more compact design without compromising on capacity, the latest addition to the Philips Airfryer range continues to offer great tasting fried food cooked with up to 80% less fat. 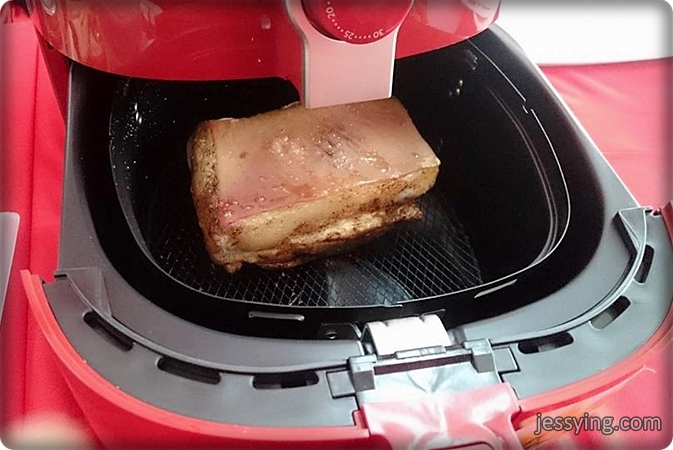 Not only is the new Philips Airfryer space-saving, but it is also time-saving as pre-heating is no longer needed. 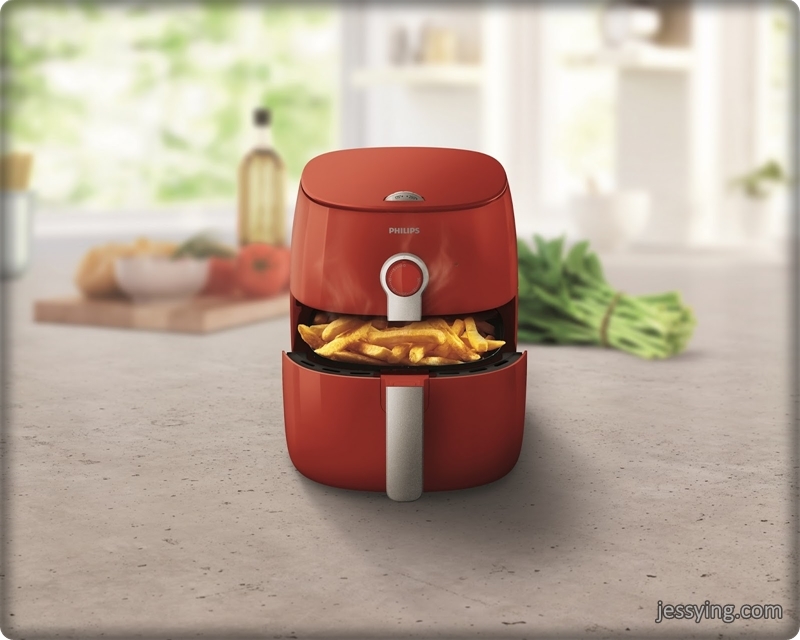 It comes equipped with Philips TurboStar technology that enables users to fry with little or no oil and produce food that is crispy on the outside and tender on the inside. The TurboStar technology also cooks fried food 50% more evenly and faster with no turning needed. In conjunction with Chinese New Year, Philips has released a limited edition red Philips Airfryer (HD9623/31) to liven up the kitchen with the festive colour. So ONG right!!! 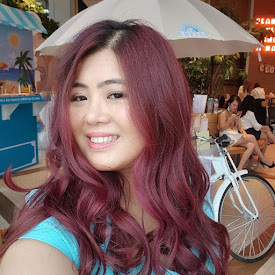 I really love this red colour! 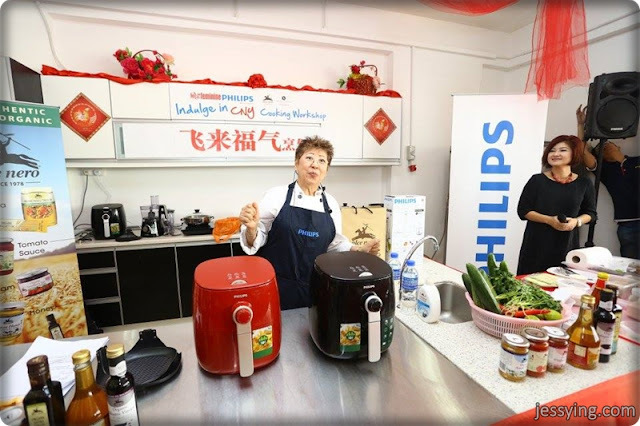 Philips invited a few of us to a CNY cooking workshop organised by Feminine magazine for the readers. So they kinda extended the invite to us. Well the only reason I agreed to go is because I want to learn cooking from Amy Beh, been seeing her cooking shows on TV since I was young...so kinda excited to see her! 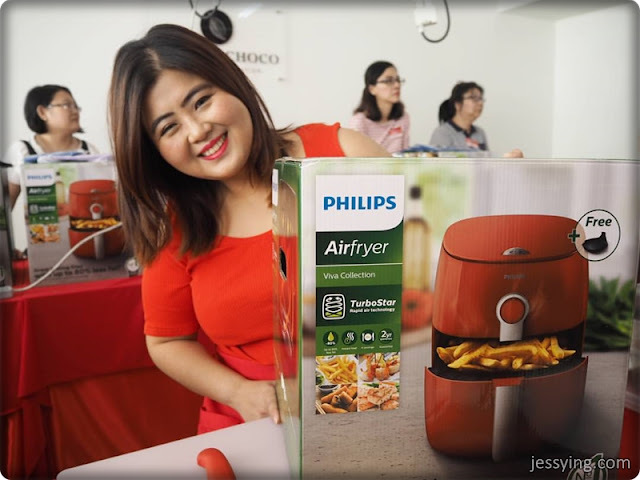 So she will be showing cooking demo using Philips Airfryer TurboStar. We used Alce Nero products and they are quite nice! Although it doesn't look that good, it tasted so good! 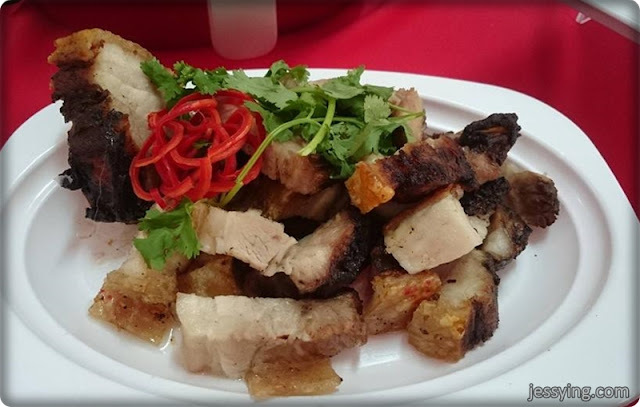 No need oil to roast pork! 1)Combine ingredients (A) and (B) in a food processor and blend into a fine paste. 2)Mix seasoning (C) into the marinade paste. 3)Lightly season fish slices with marinade paste. 4)Place the fish slices into the PHILIPS Airfryer TurboStar wire basket and grill at 180° C for 15 minutes or until fish is done. 5)Remove fish out and set aside. 6)Place smashed lemongrass and shredded ginger into the PHILIPS AirFryer wire basket. Grill at 160° C for 3 - 4 minutes or until fragrant. A sprinkle Coarse ground black pepper. 1)Cut king oyster mushrooms into half then into slices. 2)Mix lemongrass and kafir lime leaves with combined seasoning. 3)Toss mushroom pieces and capsicum pieces with combined seasoning. 4)Place the mushrooms and capsicum pieces into the PHILIPS Airfryer TurboStar basket. Turn temperature to 200° C and set time for 5-6 minutes. 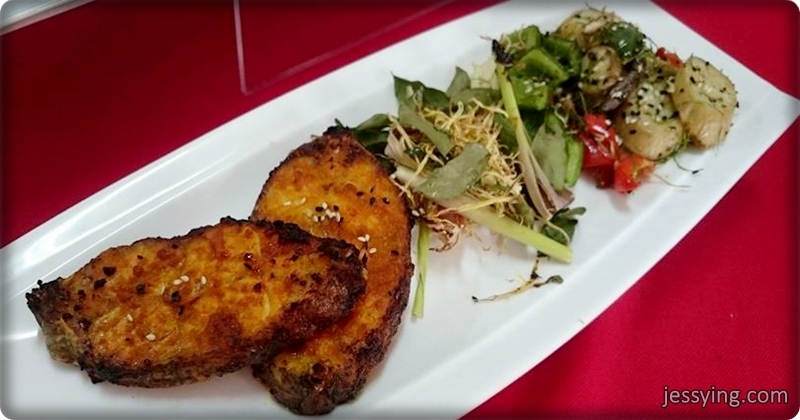 5)Once done sprinkle over with some toasted sesame seeds before serving with the grilled fish. 1)Rinse prawns well, cut off feelers and pat dry. 2)Mix tamarind pulp with 150 ml water. Mix well then strain the tamarind juice. 3)Combine tamarind juice with salt, organic extra virgin olive oil, and organic wildflower honey in a mixing bowl. 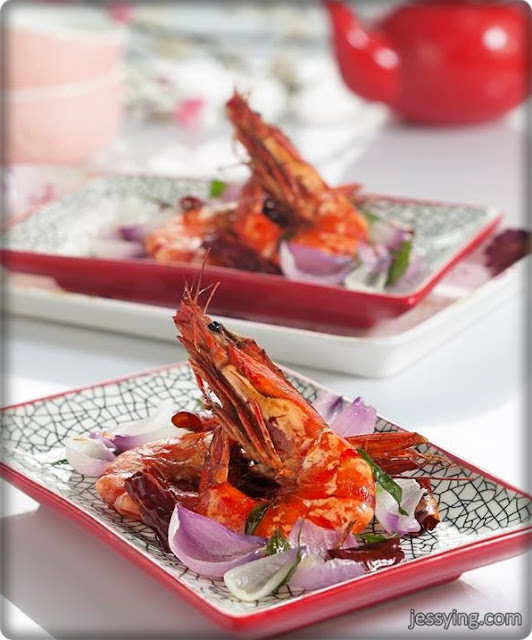 4)Put prawns into the mix and set aside to marinate for about 20 minutes. 5)In the meantime, fry dried chilies, curry leaves and onion in hot oil until crispy. Set aside. 6)Add an additional 1 – 2 tbs organic extra virgin olive oil to the marinated prawns. 7)Place marinated prawns onto PHILIPS Airfryer TurboStar basket. Grill at 180° C for 12-15 minutes or until prawns are done. Unbelievable right, who ever thought these dishes with Philips Airfryer? So fast, healthy and convenience! Anyway there are two digital version of Philips Airfryer TurboStar technology, the price are (HD9640 at RRP RM1,399 and HD9643 at RRP RM1,499).